This weekend we have our last hockey tournament of the season, and if you know hockey people, that means that it will be my entire weekend. We are fortunate to have one of my son’s friends, sleepover, so I was thinking about what I can bake beforehand for breakfast since the wake-up time is about 5 am. Ugh. So, I came up with this breakfast, homemade basic muffins and a side of homemade blueberry jam, doesn’t it look divine. 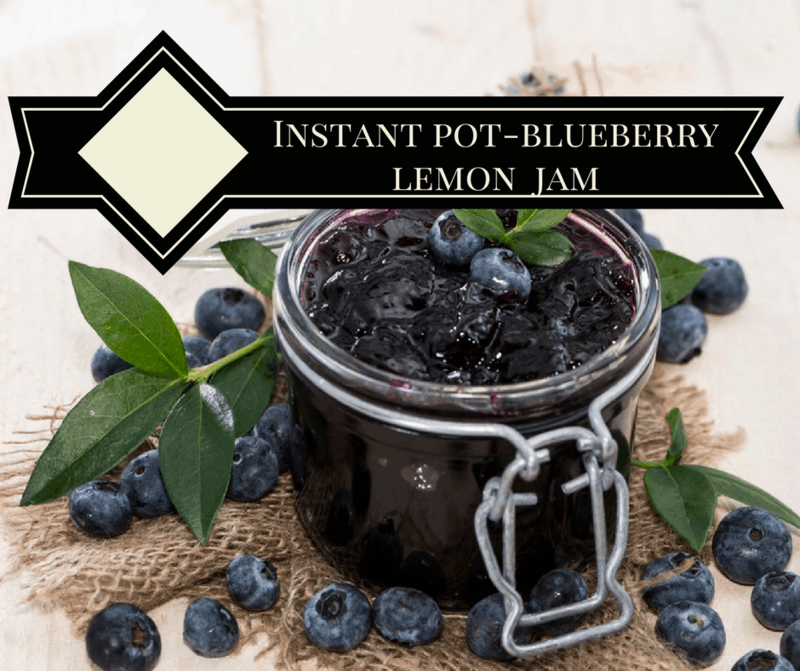 Now, the Muffins are from the air fryer and the blueberry jam is from the Instant Pot, so I combined the best of the two worlds. If you have not INVESTED, yes, I said invest, it is your time because you will save a ton of money by not eating out! It is fast. TODAY ON SALE ONLY $69.99 for the 6 Quart. I try to make breakfast to go for my kids because my kids and probably most in America eat breakfast to go, and the muffin is a perfect breakfast food. Fully portable. Today I am presenting an easy base recipe for muffins, you can toss in anything you have one hand, strawberries, blueberry, chocolate chips, etc. I made a batch last week and my husband went crazy for them, he kept on eating them and I actually never got around to taking pictures. 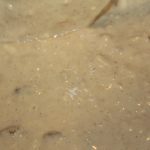 so it’s his lucky day because I just made a new batch and I hid some, so I could take a picture or two for my blog. 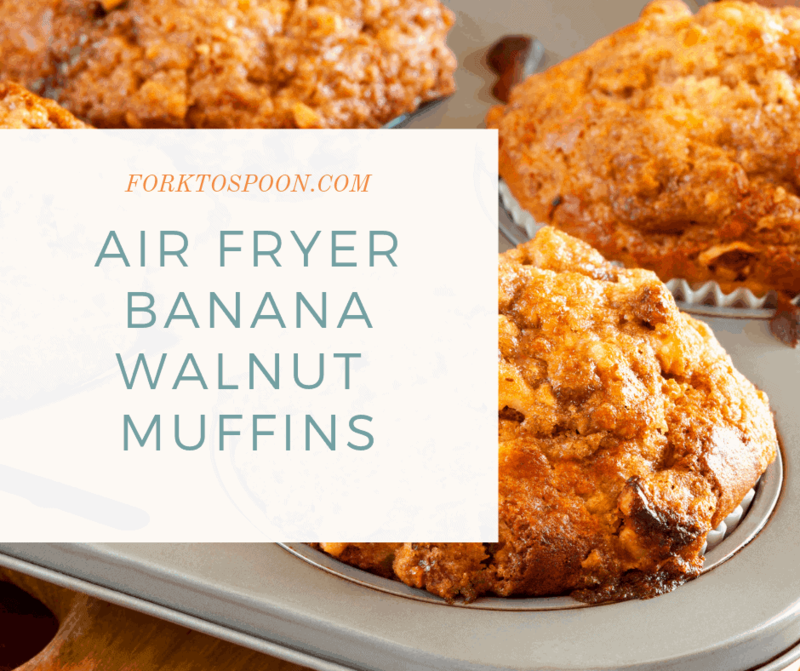 The secret to making muffins in the air fryer is time. Every air fryer is different. 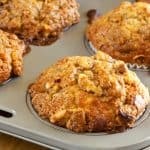 After you make your first batch of muffins, write down the time and keep a log of it, and then you can adapt it to any muffin recipe. 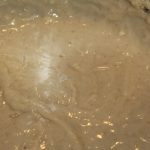 Combine all of the dry ingredients into a large mixing bowl. 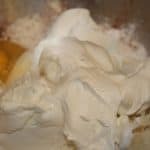 In most muffins, this will include flour, baking soda, baking powder, and salt. Whisk them all together. Whisk the wet ingredients in another bowl. This usually includes milk, oil, and eggs. Then combine the two together and mix until all of the dry ingredients are gone, scrape the bottom of the pan. 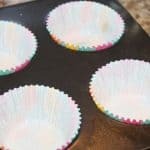 To make sure that when you fill the muffin tins, you do not come across any flour, that has not to be absorbed into the wet ingredients. Be careful not to over mix the batter, as you will increase the level of gluten and the muffins will become tough. I will give you a word of warning these muffins are addicting, you will not be able to eat just one. The flavor is AMAZING! 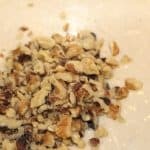 This makes an amazing breakfast, pair it with a great cup of coffee and you have the best breakfast you will ever have. I hope that you give it a sot, you will not be disappointed. 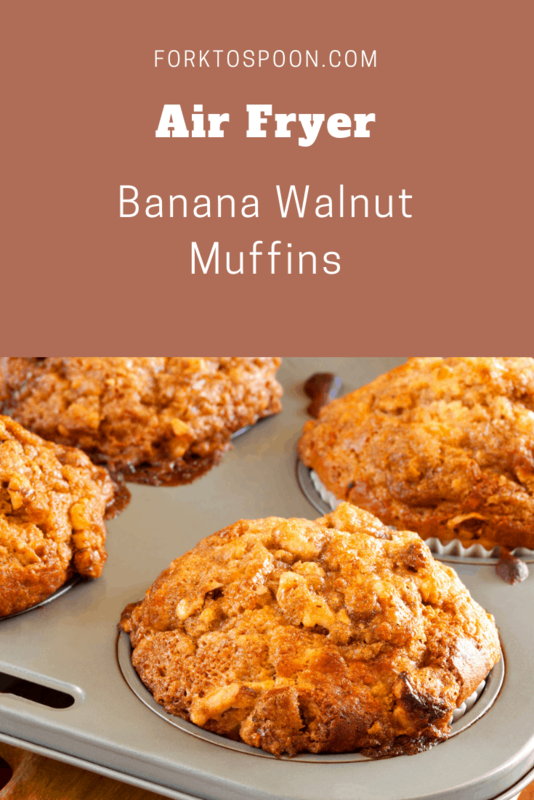 Here are some pointers about making muffins (any type of muffin) in the Air Fryer. Grab a silicone set, which is reasonably priced at about $6.00, I bought a set here and I re-use over and over again. This is my favorite set. I was lucky enough to find this set on Amazon and I have to tell you it’s amazing. And it’s easy, you just place it in the air fryer basket and set your time and then just leave them to cool off. When the pan has cooled down, you remove the muffin tin and simply pop them out of the muffin tin. For these, I spray the muffin tins with non-stick cooking spray with flour. 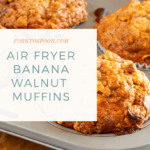 This works best in my opinion for the air fryer muffin tins. 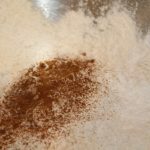 Start by combining the sugar, flour, baking powder, salt, nutmeg, and cinnamon, in a small bowl. 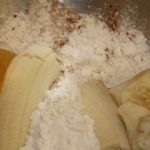 Mix in the bananas and eggs. 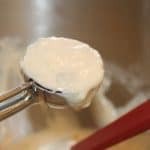 Mix in the yogurt melted butter and mix well. Mix everything well, until it's all well blended. 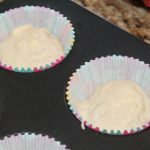 I use an ice cream scoop, which makes it easy to scoop the batter into the muffin tins. Fill the muffin tins 2/3 full. 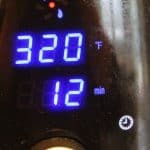 Place the muffin tin or the silicone cups into the air fryer basket, and set the temperature for 320 degrees for 12 minutes. Remove from the air fryer basket.